At the moment I feel as though I’ve been thrifting non-stop. Whenever anyone comes to stay here in London, we immediately go out to scope some bargains, and just recently we’ve had a fair few friends and family to stay. While I have a big thrift haul coming up on my channel soon- I thought I’d style up a recently thrifted piece here too, so you can see the type of pieces I like to scout for. This outfit’s focal point- the skirt, was actually a £2.50 steal recently from The Salvation Army- and I can’t stop wearing it. I don’t need to tell any of you guys reading, that I love tartan. It’s a timeless print that I always go back to, and massively compliments the pieces already in my wardrobe. 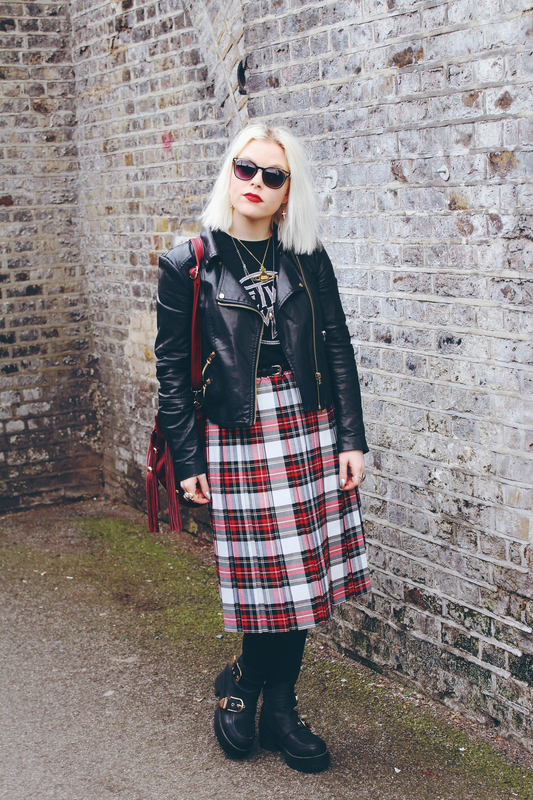 You can bet that when I spot a hint of tartan amongst the rails, in any store really, I instantly grab for it. 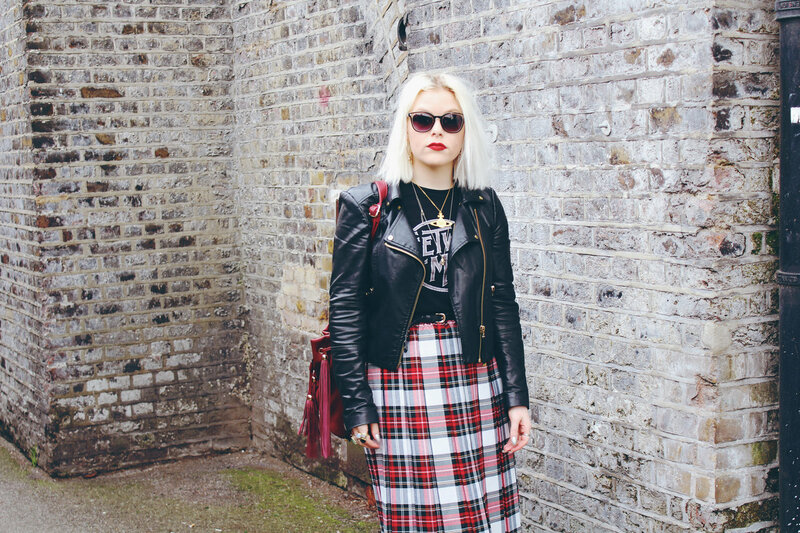 This punky kilt screamed out to me in the charity shop, and I knew it’d go perfectly with band tees and biker jackets- which is exactly how I styled it for these shots! 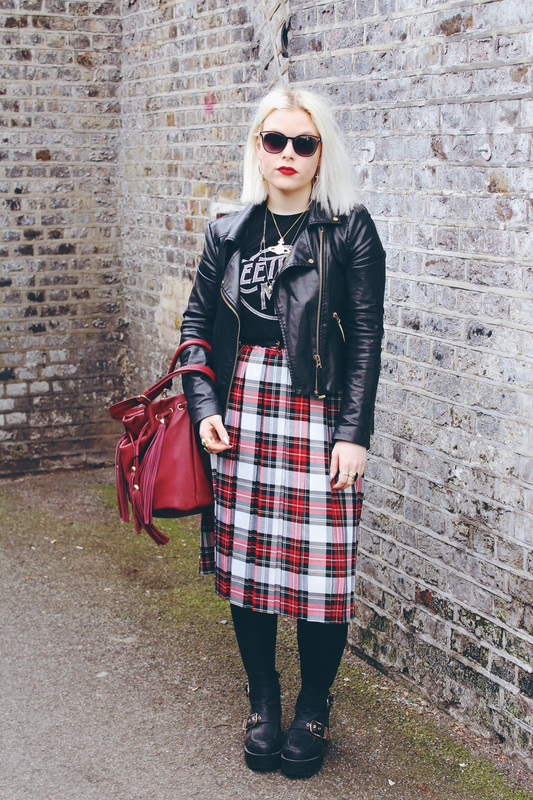 The tee is a sale bargain from Urban Outfitters and I wear the hell out of it, I’m sure if you’ve been reading my blog a while, you’ll have seen it crop up in multiple outfit posts- it’s one of my very favourites. The biker is again a seasoned outfit post regular, as I’ve had it now for going on three years and still love and pair it with everything, well done Mango for constructing such a resilient jacket! 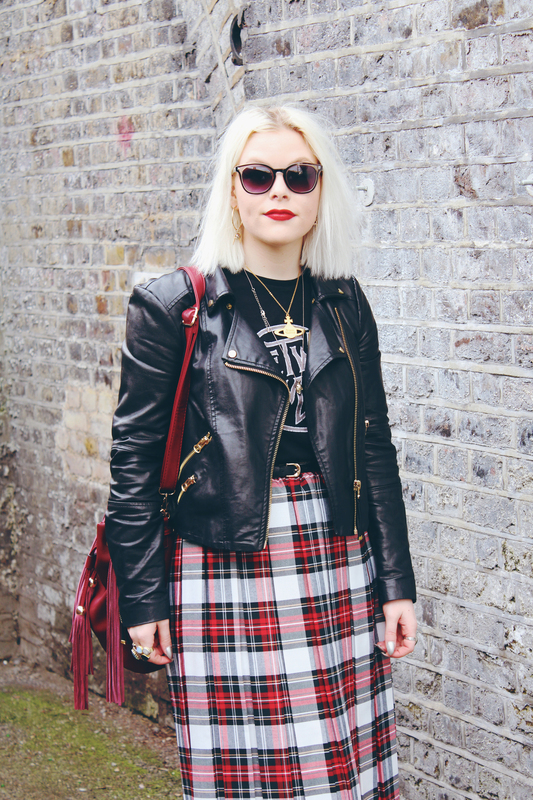 You can never go wrong investing in a good biker jacket. Accessories-wise I’ve gone for my trusty Forever 21 sunglasses, multiple necklaces from Vivienne Westwood and Julien Macdonald and then my plethora of rings, half of which I also thrifted- charity shops are the best place to find horcrux-esque rings, which are my favourite kind. Any jewellery that looks like it might have a fragment of Voldemort in it is right up my street! My mismatched earrings are H&M, and I love how they’re silver and gold so really do go with everything. My tasseled bucket bag is from La Moda- it’s so practical and roomy, adds a great punch of colour, and the fringing is a great nod to the current mega trend, which I massively advocate. You can check out this bag and more recent finds in my latest collective haul on my channel here. That skirt (and the whole outffit obvs) is so on point, and only 2.50??? such a steal!! Oh my god you are such a babe! It’s actually funny how I wore a really similar outfit recently to an alt-j concert (leather jacket w lapels, plaid skirt, leather heels). You are gorgeous!